Bread is the most wasted food in the UK with 24 million slices ending up in the bin every day! This is ludicrous level of waste could easily be resolved if we each wasted three fewer slices a week. As a part of the #MakeToastNotWaste campaign by Love Food Hate Waste this is my take on what to do with leftover bread. In fact this works really well with stale bread as it absorbs more of the delicious French toast mixture than fresh bread. Alternatively freeze any extra bread and defrost as required for this recipe. This spiced take on the classic works well for brunch or a light lunch, perfect with a nice cup of tea. 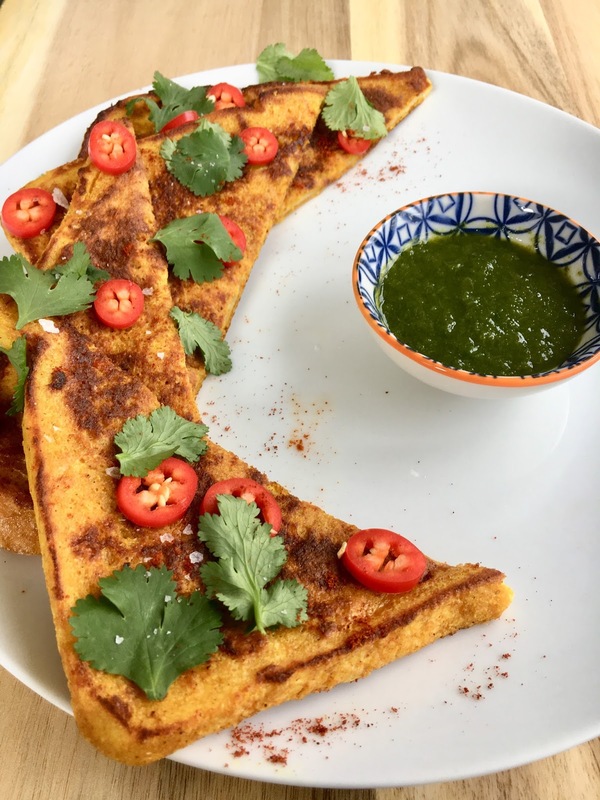 The green chutney is a zingy accompaniment that cuts through the richness of the French toast and is a perfect way to use up every last bit of any fresh herbs you have knocking about as it also uses the stalks. Enjoy! 1. 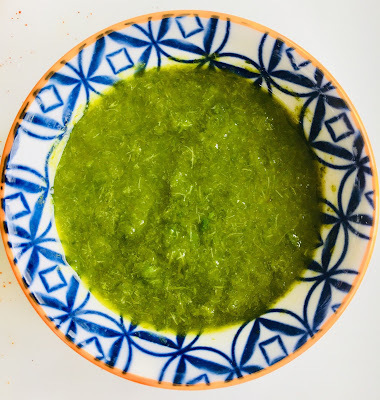 For the green chutney; blanch the herbs for a couple of minutes in a pan of boiling hot water, drain then transfer to ice cold water to stop the cooking process. This will act to soften the herbs and especially their stalks. 2. Drain and chop quite finely on a chopping board. 3. Transfer to a pestle and mortar; add a pinch of coarse sea salt, juice of half a lime and half a green chilli thinly sliced. 4. Mixed well until you have a bright green chunky sauce. 5. Adjust salt, lime and chilli to taste. 6. For the French toast; combine the eggs, milk, salt and spices in a bowl so that all ingredients are well mixed. 7. Transfer mixture to a large shallow bowl or large rimmed plate. 8. Set a frying pan over a medium heat add a glug of sunflower oil and knob of butter to the pan. 9. Dip the slices of bread into the French toast mixture, make sure they are well coated but not so much that the bread falls apart! 10. When the butter is beginning to bubble place the dipped bread into the pan. 11. Cook for 3-4 mins on each side or until each side goes golden brown. 12. Transfer to a plate and get stuck in! 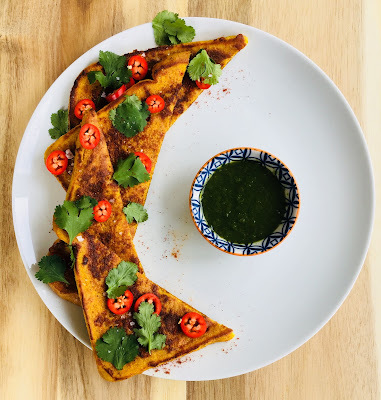 · I cut the French toast into triangles and arrange them around the edge of the plate. Season with coarse sea salt and hot chilli powder. Then finish with some coriander leaves and chopped chillies scattered over the top. Serve the chutney alongside in a little dish. · If there is any remaining French toast mixture then carry on cooking off any bread that you still have. · The above recipe doubles easily if more quantity is required.